Kansas Governor Henry J. Allen writes to C.D. 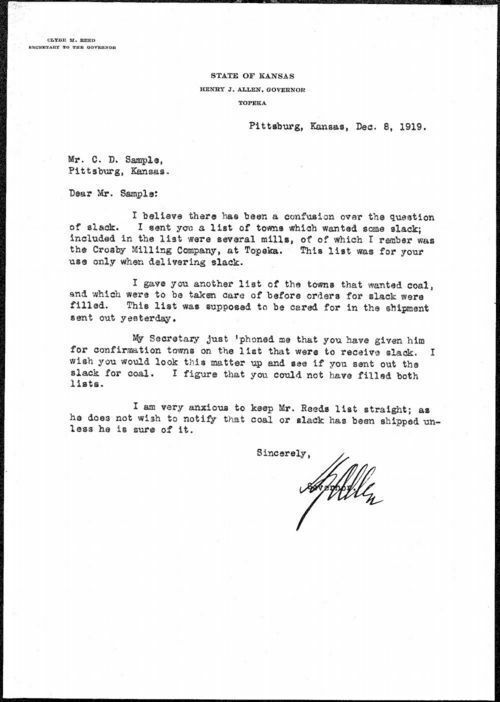 Samples of Pittsburg clarifying coal deliveries during the state takeover of the southeast Kansas coal mines. Labor strikes prompted the takeover. Volunteers, many unskilled laborers and managers, were used to carry out mine operations. Volunteer mining operations began on December 1, 1919. Communities in desperate need of coal often complained of the shipments received. The strike ended December 10 when a final agreement was reached.